I saw a friend… down in Port Orford today who went to radiation yesterday at Coos Bay. The friend who drove her showed her the Peace Rocks around the sign outside the building (where patients receive radiation treatments). She cried. She thought they were beautiful! I told her to help herself; that we'd restock them. Touching the world some more- rock by rock. A.W. I stopped at the Langlois Post Office this morning. I saw the bucket of peace rocks in my backseat and decided to take 2 into the post office. The post master was touched that I brought her peace rocks. She had heard from a customer that there was a peace rock sitting by the front door of the post office on Monday. This morning it was gone. She was sad. She wondered who would steal a peace rock. Now she has a replacement. She has a "Share Peace" rock on her counter for all customers to see. The post office worker in the back of building heard us talking about peace rocks. She came forward and shared that she was on the beach looking for agates the other day, and found 4 peace rocks. Both women thought the peace rocks distribution was a great idea. We are changing the world with one peace rock at a time. One [peace rock] went on the ground in front of the door of a friend's car that was parked at Ray's. Today I went to visit her and was pleased to see it displayed in the front of her beautiful down town garden, a garden many walk by. She is a wonderful, spiritual woman. She told me, " I looked around the parking lot to see if there were more. But there weren't. I had been meditating on peace in my life, trying to overcome anxious feelings about my health. Every time I walk by the rock coming and going from my house it reminds me to take the time to experience quiet, stay connected and nourish gratitude. And now, symbols of peace keep appearing....doves and the peace sign." My friend speculated on who had put the rock there. I loved having the secret that it came from Unity. We had such a cool contemplative conversation that might not have happened if I'd admitted to the deed. Some day I'll tell her...or maybe not. Why did this particular activity capture me so? I think it is because of my continued fascination with Dr. Emoto's work with water and crystal formation. To this day those images from 'What the Bleep' continue to evolve me....more so than any other works I have studied. I have read several of his books more than once. I find his message to be at the core of spirituality for me. The peace rocks are a profound opportunity to 'work' that science. 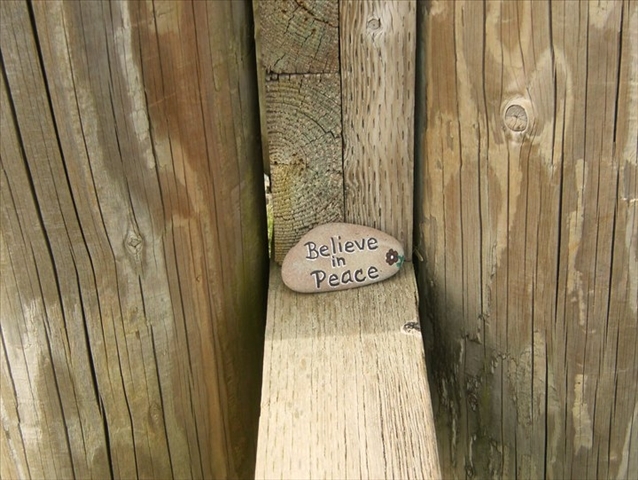 "I absolutely love stumbling upon one of these rocks around town. It does truly spread joy. I know I smile big when I see one. Thanks!!" Spotting a rainbow out the car window, a grandma asked her two young grand-daughters if they wanted to see where it ended, conjuring up visions of the pot of gold. As they approached Battle Rock Park, the youngest child pointed to the biggest seastack on the beach and shouted, "It ends by that big rock, Grammy!" The trio climbed down to the beach and there they found a rock… with a rainbow painted on it! They looked around the beach some more until they found two more, one with the word “peace” and some flowers painted on it and another one with fireworks. My name is CL and I was given a pocket Peace Rock at a Yoga Workshop a couple weeks ago, it was very inspiring and nice to have. I want to get some more, in different shapes and sizes for gifts and just to place around. I also wanted to let you know that the word is spreading in West Virginia too. Love this wonderful idea!! The workshop was at Bliss Bliss Bliss in Morgantown, WV, And I'm also in Morgantown, WV. Do you all have a website that sales or do you do special orders. 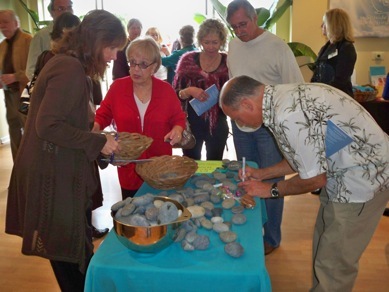 Great Peace Rocks update from my friend in Encinitas, just north of San Diego. Her church presented river rocks to all congregants several weeks ago at church along with paint pens. Everyone at their church got to create a Peace Rock. The minister talked about our church creating Peace Rocks. They now have a table set up outside the sanctuary for people to stop by to paint more. They are finding Peace Rocks popping up all over the town. The love continues to spread! Wait till the senators start getting them. I do remember reading about your Peace Rocks… I LOVED that story. So creative! And I’ll surprise people with it here in the Fort Worth area… Add Texas to your list!! Did you know that I’m releasing a book this fall through Unity House on peace? It’s called, “Let It Begin with Me: 21 Visionary Leaders Discuss the Practice and the Possibility of Peace.” We’re hoping churches will take on a practice of making September “Peace Month” and using the book to generate ideas for bringing peace into every area of their life and community. Have you done much pr yet with your Peace Rocks website? I see this as taking off much like Rev. Will Bowen’s “Complaint Free World” bracelets! 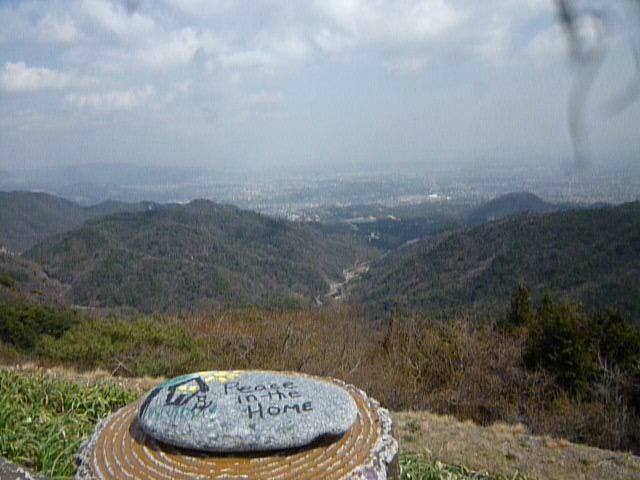 I've been meaning to tell you that the peace rocks you gave me to take to Italy all found a good home in the old world. I gave the one that was painted with a red heart to our hosts who housed and fed us while we were at Terra Madre. The "Love" rock found its way into a surprise marriage proposal picnic that we set up for Danny's best friend on an isolated beach on the Mediterranean (a wonderful story I'll have to tell you sometime, not on email). As for the "peace" rock, I had thought I would wedge it into the stones at the Vatican in hopes of nudging the Catholic church a little, but we never made it as far south as Rome. Instead, we went to Assisi - which seemed like the perfect setting to leave it (on a warm, southwest-facing stone wall overlooking a beautiful valley in Umbria where St. Francis was born). I wanted you to be able to imagine those rocks. It was fun to find homes for them along the way. Thank you for thinking to send me with them!